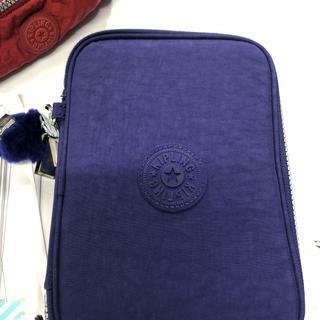 https://www.kipling-usa.com/100-pens-case/100265677.html 100 Pens Case The 100 Pen Case Organizer is a must-have for anyone who is looking to keep small accessories in order. The name says it all; you can fit up to 100 pens or pencils inside its roomy interior – 26 within the pen loops and 74 within the base! This colorful pen case can also be used for art supplies, makeup, or as a travel cosmetic case that can easily be thrown into a backpack, tote, or carry-on luggage. The 100 Pen Case Organizer is a must-have for anyone who is looking to keep small accessories in order. The name says it all; you can fit up to 100 pens or pencils inside its roomy interior – 26 within the pen loops and 74 within the base! This colorful pen case can also be used for art supplies, makeup, or as a travel cosmetic case that can easily be thrown into a backpack, tote, or carry-on luggage. the color I love it! The case is practical, all my kids pens can be stored in it for school. The color was not as "orange" as showed in the web page, but it is still very nice (more like the color of a brick). Really good quality. It's a great product bought many of these before, takes a long time to wear out and very fashionable. Purchased for my daughter (9yr.) who loves art and organizing! She loves it. I am very happy :) well made. pretty color. easy to use. but, wish these are 100 holes for pens. I bought this case for my son and he loved it! The size is great. Let me start by saying this is 100% my fault. I got exactly what I ordered. However, I feel that the the product name, "100 pens case" is more than a little misleading. The title led me to believe that the case would hold 100 pens. Sadly, that is not the case. The "100 pens case" only has elastic loops for 26 pens. I realize the case is large enough to hold more than 26 pens, but I was hoping to have a loop for every pen. I learned a valuable lesson. READ THE DETAILS before ordering.